7% Tolerance! Smooth custom taper! The best push-pull pot available! This is the best push-pull potentiometer on the market. These aren't your standard off the shelf CTS pots either. We had them custom made to our specification to have the smoothest taper possible and the tightest tolerance available. The switch contacts are side-mounted which makes them ready to drop into most guitars without the need for deeper routing. There are a number of wiring options with these pots that can give any guitarist total control over their sound. I have a 1989 Ibanez AM300 that I put Fender Hot Vintage Alnico II humbucker's in (I have been playing blues,& rock for 55 years these are the best humbucker's I have heard!) Since they sounded good split from the Fender HH Strat I took them from I purchased these CTS DPDT Push Pull Pots because the the guitar is thin. While I followed the instructions for Coil Cut with the ground going to #2 when I finished the pot push pull was reversed (down split/up full) moved the ground to #1 and it worked perfectly so keep in mind should you have the same problem. So Keith who posted before me is one of those people who likes to blame others for his own ignorance. They are labeled push- PULL not PUSH-PUSH or POP UP Incidentally if you ordered "Pop up" you'd probably get a pot that pops outward when you push it, but then acts like a regular pot- not switched. Learn what you're talking about rather than blame others who have accurately labeled their products! Nice quality pot - the best push-pull made...EXCEPT for one detail. These are NOT spring loaded push pull switches! This means you must grasp and lift the knob, which is a slow, distracting, imprecise and clunky process on a Strat style knob. Grasp and pull is just not as good as spring loaded popup. Really hate to give these a not perfect rating, as I appreciate Mojotone's effort to bring them to market. Unfortunately, in my opinion these otherwise wonderful pieces are of pretty limited use on a Stratocaster (or any) guitar with a tapered top volume knob. The Strat knob design just does not provide for good lifting / grasping grip. These might be fine for LP / Tele knobs...but for ease of use, these do not compare with spring loaded. 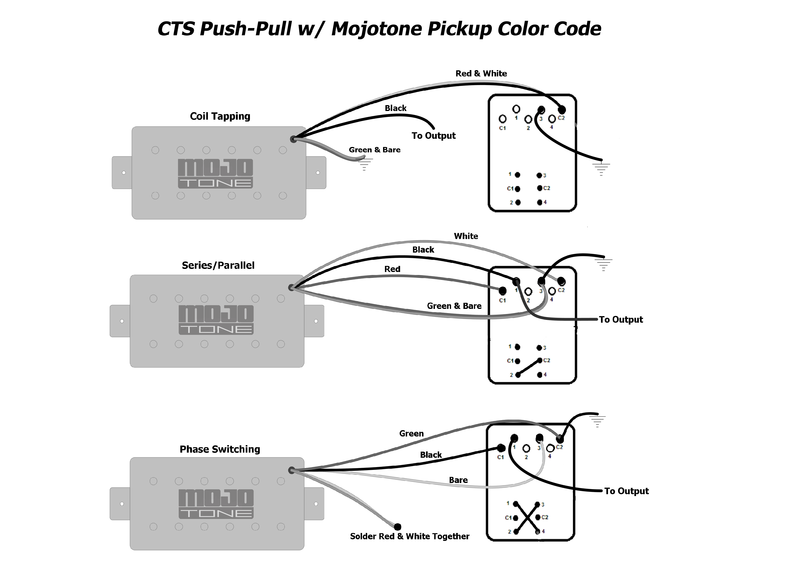 It might also be nice for the purchaser if Mojotone posted clearly with the part that these are not popup style switches. That information was impossible to find, so I bought them blindly, just to find out for sure. So, future buyers be aware: these are NOT popup style push pull switches. they must be pushed and pulled. No spring assist. Conclusion: As compared to a spring-loaded popup switch, these are somewhat clunky and distracting to operate. Wish someone made a spring-loaded version at this MojoTone part's overall quality. As promised by Mojotone, they are a very nice quality part. I was quite happy with them, except for this detail. The best switching pot I've used. They are on all my dual coil guitars. They tolerate resoldering extremely well and are flawless in operation.